I cut the window frames from cork - a slightly thicker cork than the coasters that I used for all the villa's flooring. Except for the front and end windows, which are only implied within the large arched openings, the villa has only five windows; two in the lower level and two in the upper level, plus a tiny "sliver" of a window in the upper back wall. I applied a thin layer of joint compound to the cork, then brushed with a damp sponge to smooth just a little. Then a base coat of Ceramcoat's Deep Taupe paint was applied. "Stone" colors dry-brushed over the base coat: Cable Knit Grey; Bleached Sand; Trail Tan; Territorial Beige; all by Ceramcoat. As an afterthought, I decided to extend the stone frame around the arched upper sections of the windows, instead of stopping at the beginning of the arch. I cut those pieces from cork as well. I used the same finishing process for the arches. The two window frames are ready to mount around the lower arched windows. I had been thinking and looking and planning and experimenting for months, trying to find the right thing to use for the security grilles on the lower level windows. Nothing presented itself. I had finally settled for a less-than-desirable option, but it would have involved much revision, and the final outcome was dubious at best. BUT THEN one afternoon I was reorganizing our shelves of baking tins and cookie sheets, and I found a seldom-used, hidden-away cooling rack. It was the perfect thing for the perfect window grille. I begged it off Robert, since he's the household boss of all things culinary. He obligingly let me have it for the sake of the villa (and probably for the sake of household harmony) and one big problem was solved. The wires of the cooling rack were easily cut with tin snips. I measured and snipped out the pieces that I needed for the grilles. Then I had only to bend back the end wires with needle-nose pliers. A dry fit was successful. ...by brushing on a texturing gel along with Maple gel stain and Spice Brown paint; then I dry-brushed on a hint of Territorial Beige. You may remember this original plain window from a previous post, before I added the stone frame and the iron grille. Here are two views of the completed lower windows. This photo shows one of the original upper windows. The paint looks a little scruffy here - I "unscruffed" it before adding the stone frame. The upper window after adding the stone frame. AND THE WINDOWS ARE FINISHED! I made a cardboard template to use to draw the balcony brackets, which I cut from styrofoam. These are the components that I used to construct the balconies. Just as happened with the window grilles, I had searched in vain for a long time for the right material to use for the balcony railings. I could find nothing that I was able to work with to make a traditional Tuscan railing. BUT THEN, when I was in Hobby Lobby one day, browsing in the ribbon section, I found a roll of ornate tin (or something similar to tin.) All thought of Traditional Tuscany flew out the window, because I fell in love with the tin "ribbon" - and that was that. The balusters have been secured to the balcony floors. Joint compound was applied to the balconies and balusters. I etched a "stone" floor pattern into the slightly set joint compound. However, I changed my mind later and covered over the stones to make a plain floor. I cut the tin railings to fit. One side of the tin ribbon is unfinished, with sharp edges, so I glued two pieces together for a more finished look, plus added stability. I added rounded wooden caps to the balusters and stuccoed over the caps. I used thin strips of balsa wood to make caps for the railings. All the tin railing pieces have been measured, cut, and glued together. Time for a dry fit. And - they all fit! Whew! Time to paint the balconies - first a base coat of Deep Taupe. I dry-brushed the usual "stone" colors over the base coat. All finished. Just in time to start over! I didn't like those stones, so I smoothed out the "stone" markings with joint compound and sanded lightly. I repainted with the base coat of Deep Taupe, then continued with the same "stone" color palette as before. Apparently, I forgot to take a photo of the final coats of paint on the balconies. You will see the finished product somewhere below. The balcony brackets have been covered with joint compound. A Deep Taupe base coat has been applied, followed by paints from the same color palette that I used for the balconies and window frames. And the finished stone brackets are ready for the balconies. ...and a touch of Territorial Beige. The front railings are ready to attach to the balconies. I didn't add the side railings until the balconies were secured to the wall, because I wanted to be sure that I had the exact measurements. The short balcony on the east wall is secured! This was the easiest one to handle, of course, because of its smaller size. Easy Peasy. I used a bead of hot glue, along with beads of Tacky Glue, to ensure that the balcony would hold until the Tacky Glue dried. I used my favorite pink spackling to go around all the edges of the balconies and brackets to fill any gaps. This is the balcony outside the master bedroom and over the living room. And this balcony is outside the center bedroom and over the dining room. Closer views of the spackling work. The touch-up painting over the dried spackling has been completed on all the balconies and the walls. AND THE BALCONIES ARE FINISHED! The count continues on the clay Roman roof tiles for the villa. I've made 485 curved tiles, and I need 585 more. I've made 506 flat tiles and need only 124 more. Of course, these numbers are estimates, but it gives me an idea of how much time it will take to make enough tiles to complete the roof. Which means that now I have to work MUCH faster than I have been doing! November will find me busy making more clay roof tiles for the villa, but I'll continue to work on other exterior projects as well. A wall is needed along the front; a grape arbor must be built over the loggia; many vines have to be made (or contrived); the villa needs flowers; and I'll need to re-work numerous pieces of furniture that I want to use throughout the villa's interior. There is still much work to be done, but I'm feeling excited to be getting closer to the finish line - although I'm more scared than excited about laying the roof tiles. YIKES! This applies to Everything you've done- ABSOLUTELY MARVELOUS!!!! I LOVE the look of the arched stone trims and the GRILLS..... Girl You've GOT IT! your solution is BRILLIANT! I ADORE your balcony supports AND the Iron Railings!!! Seeing them installed and how PERFECT it all looks is making me want to get up and sing! Hi, Elizabeth - Your enthusiastic and complimentary comments make ME want to get up and sing! I also want to sing because the windows and balconies are finally finished, after all these months. I feel that I've passed a major milestone in the villa's construction, and the going should be good from this point. Except for the roof! I keep forgetting about the roof! But that'll be a while yet, so I'm staying calm for now. It always feels great to just happen across something that I've been searching for and have almost given up on - and suddenly, there it is! And never where I'd have expected to find it. I love those serendipitous moments! The balcony railings and the window grilles had been worrying me for a long time, so I'm greatly relieved to have the search over with. the balcony is great !!! The whole house will be great! I'm always amazed at what simple means you can build such beautiful things. Hello, Sigrid - Thanks for your comments. I think a large part of the fun of miniature construction is coming across odds and ends that can be turned into something entirely different. I love those unexpected finds! Amazing, as usual! I love the balcony "tin" rails/fencing! What a great find and you made it look so realistic (and to think it's just a ribbon roll craft!). Can't wait to see your progress on Dec. 1st's post! Hi, Lori - I'm not sure what you mean by "mistakes." Who, me? Mistakes? You aren't the one who was out there snickering, are you? But as a matter of fact - yes. Absolutely yes, I'll be making way more roof tiles than I think I'll need. Because sometimes you just never know. Those mistakes disguise themselves and lie in wait for me, and I trip all over them! Thanks for stopping by - and I'll try for some mistake-free progress for the December post! Que magnificas ventanas de rejas y balcones de forja,son perfectos,me encantan!!!! Hello, Pilar - Thank you for your encouraging comments. I'm happy with the way the windows and balconies turned out. But mostly, I'm just relieved to finally have them finished without too much trauma! I am so impressed by your work. It looks fantastic! I just love the stone window frames and the security grills look perfect. What a terrific idea to use the cooling rack. The balconies are fantastic and look terrific on the house. I think you were right to make the balcony surfaces smooth as it makes those gorgeous railings stand out. Your finishes and ageing are spot on and the entire villa is not only beautiful, but everything looks right. Hello, Giac - I'm happy with your comment that "everything looks right." That's always my goal, but one that is often hard for me to reach, so I especially appreciate your valued opinion. Thank you! The window grilles and balcony railings were interesting and challenging to put together, but also completely enjoyable. (In retrospect!) But I'm happy to have them finished so that I can move on to the next thing. Please stop by in December and check out whatever the "next thing" may be. Wow! Fantastic work! The balconies' railings look awesome, not to mention the rest of the details. Thanks for sharing these photos. Hello, Drora - Thanks so much for stopping by the Villa del Vigneto! I appreciate your nice comments, and I hope you'll be back as the work continues; you're always very welcome! Dear Marjorie, I have enjoyed so much reading this post and having the secrets of styrofoam revealed! I love it that you share your techniques in the use of such available materials. Great that you and StudioE are both working on Italian villas. Hello, Janine - It was so nice of you to visit the Villa del Vigneto. I enjoy sharing my adventures in styrofoam - because styrofoam is so forgiving! (You'll hear that often from me!) Yes, it's interesting to see the very different approaches that StudioE and I take in constructing our villas. (Lovely Old World Elegance vs. a more countrified retreat.) So much fun! I hope you'll come by again. 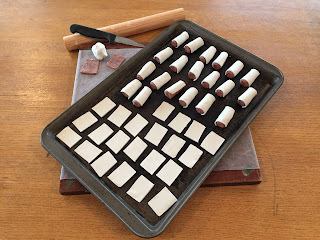 Hi, Troy - You've made me laugh with your reference to "pigs in a blanket," because I used to make those for my daughters when they were small. 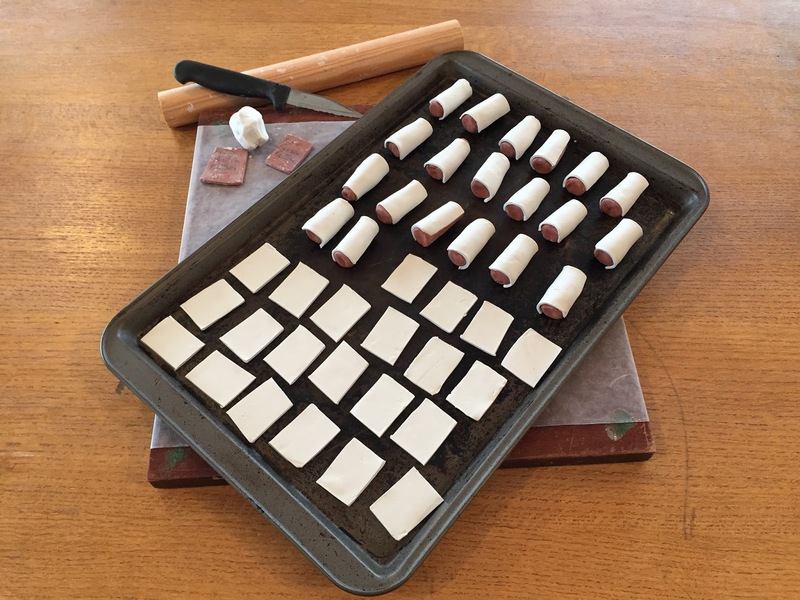 As a result, every time I "bake" a new batch of roof tiles, I think of those pigs in blankets! I think those tin railings would be wonderful in a Victorian setting. The design is probably more suited to Victorian than Tuscan - but I could not help myself! I found the "tin" rolls at our local Hobby Lobby store in the Craft Ribbon section. I hope you can find some. 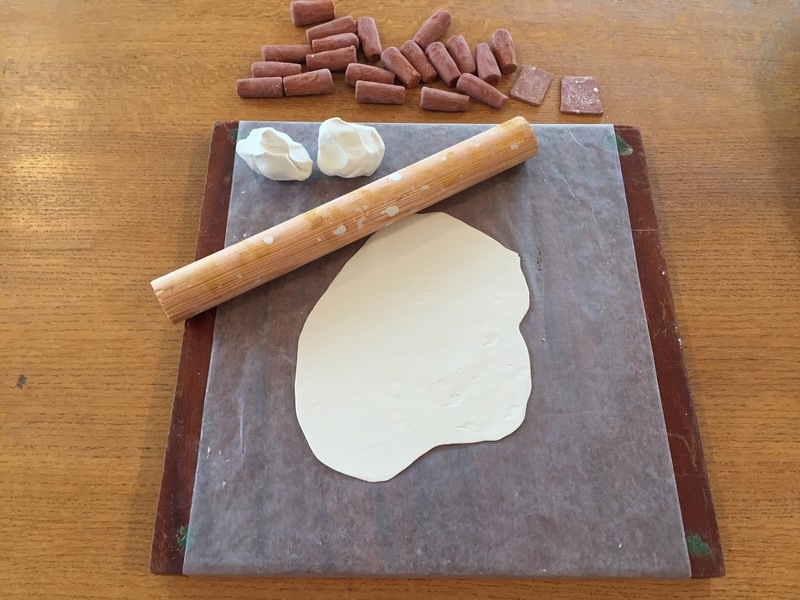 Thanks for the Ludowici Tiles suggestion; I looked them up and found a treasure trove of tiles! At this point, I'm mostly interested in the way the tiles age, and I found great photos of old, old tiles that have aged beautifully. There's a huge variation in color, shape, and uses for clay tiles that I never knew about. I had a nice browse! Hello, Julia - Thanks so much for stopping by Villa del Vigneto; I appreciate your encouraging comments. Construction is moving along fast, but I think the hardest parts are over with - except for laying the tile roof! But I have a few things to do before I have to tackle that job. I hope you'll visit again to see what's new! Your visits are very welcome at any time! Hi Marjorie! I am sorry to be so late to get here and see all your Fantastic progress! The balconies look amazing! I Love that decorative metal you used.... as well as the very "functional" grills for the side windows! I am so glad you used that cooking rack.... clearly it has proved to be the perfect material! It is exciting to see the project really coming together.... allowing you to make all the little pieces that make it really look lived in! The roof tiles are probably a bit like my tiles for the Castle great Hall floor... I had to cut and bake and paint and glaze every single one of the 1300 or so tiles!!! It took me several years from start to finish... but then, I never seem to go straight to the finish line... detours are so much more fun! LOL! Must be why I am still "working" on so many projects!!! I admire your perseverance and I think the Villa is looking Awesome! Hello, Betsy - I'm always happy to read your comments, no matter when they arrive! Those roof tiles are becoming a burden to finish - but only because I procrastinated early on when there seemed to be no hurry. But now the time to hurry is upon me! And since I usually do go straight for the finish line, I don't even have any "standby" projects to work on - so I guess baking batches of tiles is my focus for the foreseeable future. Now I understand why you like those detours! Thanks for stopping by.